Right now establishment Republicans and their short-term allies in the media think they won and conservatives lost when Capitol Hill Republicans abandoned the fight to defund ObamaCare and obtain real spending reform as part of a deal to raise the debt ceiling. In fact history shows us that the exact opposite is true. While the long knives of the establishment may be out for Senators Ted Cruz and Mike Lee, and their cohorts in the House, from a strategic perspective this apparent defeat was a win for conservatives, and here’s why. Millions of Tea Party and limited government constitutional conservatives, who were disheartened by the failures of the 2012 campaign, have been re-energized by the battle to defund ObamaCare – and now they understand that, as much or more than Obama and the Democrats, the enemy is the Republican establishment. Their energy and anger means those Republicans who were on the surrender side of the ObamaCare battle are done as national leaders. Sure, they may hang on to their present positions for a while, but in the eyes of the Republican grassroots they are all politically dead. Just as the battle over the Panama Canal Treaty back in the 1970s grew the New Right – it also effectively ended the presidential prospects of establishment Republican Senate Minority Leader Howard Baker, who backed it and assured its ratification; the same will be true of those Republicans who surrendered on ObamaCare and raising the debt ceiling. And here’s the first evidence of the truth of our analysis – no one in the surrender caucus is heading for Iowa or New Hampshire today to tout their success in bringing the battle to a close. Submitted by aarona422 on Thu, 10/17/2013 - 23:56. ...was the low point of the shutdown. The shutdown may have currently hurt the GOP's overall favorability, but this was a necessary shake-up. The bold conservatives of the Tea Party had to rock the boat. To do otherwise would be to keep the status quo that keeps the Establishment Republicans in power. 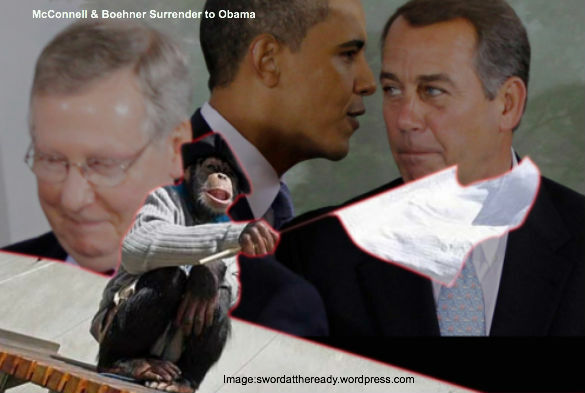 The shutdown shake-up of the GOP has now put into play a new dynamic and has made the battle lines even clearer... Tea Party versus Establishment Republicans. It certainly made things clearer to me... the Tea Party now has an edge against the GOP Establishment. Because it's not so much that the Tea Party has to defeat the Establishment Republicans, it's that the Establishment Republicans need to be taken out of office by any means (even Democrats), as any vacuum created by their removal will automatically be filled by the Tea Party. This upping the ante for 2014 does make headwinds stronger against the GOP across the board, but the Tea Party is set to weather the storm much better than the Establishment. The GOP Establishment is set to become extinct... it is only a matter of time and effort on the grassroots conservatives' part. It's pretty simple... Defeat as many of the ERs as you can in the primaries, and let those who win their primaries be left on their own in the general, even if means a Democrat might win. Most any Democrat that wins that way is just going to lose to a Tea Party candidate when up for re-election the next time around. The Establishment Republicans are seriously hampering the real fight with the left over this nation's future... they have to be taken out of the equation before bold conservatism can be asserted once again upon this country. The Tea Party takes a loss and it can come back. The Establishment Republicans take a loss and nobody wants them back.